Last year I was a psychologist teaching at a university. This year I am a stay-at-home Mom. During the summer that bridged the gap between these two worlds, my wife gave birth to our son. All of this makes me a lesbian, non-biological, stay-at-home Mom. It also makes me tired. But first, I should back up a bit. My name is Alison and in the fall of 2008 I married Parker Armstrong. 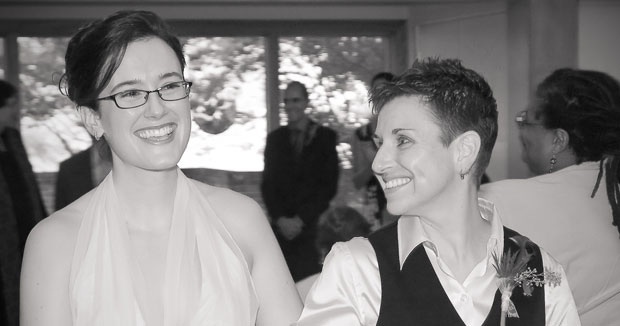 In the “pave your own way” nature of lesbian marriage, I took her name and she took mine. Well, actually we both took my last name as a middle name and her last name as a last name with the idea that our children will share this middle name last name combination; a family name of sorts and one that requires us to agree on only one name per baby. Bonus! By the time Park had decided she was ready to “sign me up” (her exact words, I couldn’t make that up), we were already talking about children. In fact, the moment my short-haired, polo shirt clad, “just one of the guys” girlfriend told me that she didn’t just want to have kids she wanted to have kids, all of my instinctual feelings of rightness about her were confirmed. She was indeed the woman for me. Three years later we’ve got both a one year old son we call Yogi and a lingering case of baby fever. These days I may not be lecturing about stereotyping and gender theory in a classroom, but the issues are top of mind just the same. I am after all a woman “married” (not legally recognized in our state) to another woman raising a boy in the South. Did I mention the part about the South? Oh yes, that is in the mix as well. I’m only one year into the parenting gig, but so far it’s looking like lesbian parenting offers a pretty interesting perspective on all things gendered. So, if you wonder about things like whether your butch wife “counts” as a male role model or why your family insists on buying baby clothes that involve camouflage (really, camouflage? For a 3 month old?) I hope you will join me here and we can wonder about it together. If you have the time, leave a note in the comments and tell me a bit about your story. Alison Armstrong* is a Southern, Stay-at-home-Mom getting used to life outside of academia and raising a child, Yogi*, with her wife, Parker*. You can follow her family’s adventures at her blog, Love Invents Us. *Names have been changed in order to honor a flair for the dramatic and to play nice with the family.